1. Spy a castle on the map. 2. 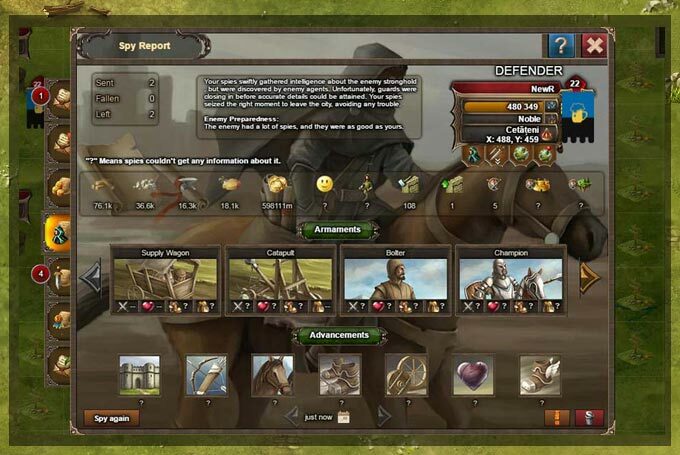 Send spies while orginizing your troops on the attack screen. You can send spies to gather information about a player that you are viewing at the moment. Set the number of spies and hit the "Send" button. Each time you get a rundown of what happened during the mission. As you can see in that case the enemy had "Much less spies" and "They were ill prepared" means you have a certain research advantage. 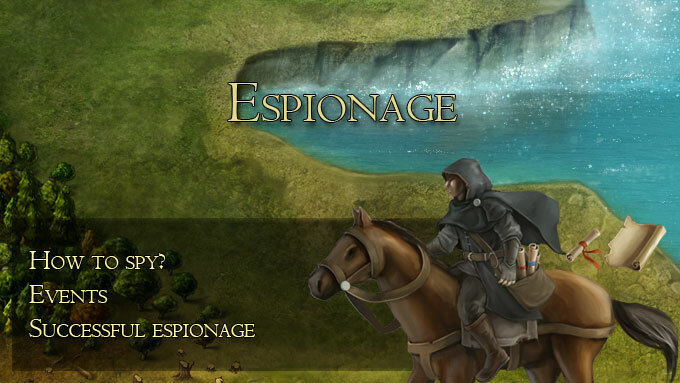 When equal spies, 6 Levels in espionage advantage equals added 50% chance to win. 100 spies lvl 1 vs 50 spies 7 = 50% chance. 10 spies lvl 6 vs 10 spies lvl 0 = 100% chance (reduced to 95% max). 20 spies lvl 1 vs 10 spies lvl 1 = 100% chance (reduced to 95% max). 15 spies lvl 3 vs 10 spies lvl 6 = 50% chance. 15 spies lvl 3 vs 10 spies lvl 0 = 100% chance (reduced to 95% max). Success: Goes to gathering information. Does not notify the enemy of your actions. Failure: You try to return home without being detected, failing once more gets you into a fight regardless if you manage to get information or not. 2-A: City defenses and garrisoned army headcount. 2-C: How many people they have and how happy they are with their ruler. 2-D: How much their military has advanced in tearms of improvements. Success or failure in this step determines what you get and whether or not thy enemy gets a report. If there was a fight the attacker failed to stay undetected on multiple occasions regardless of information gathered. Depending on the various outcomes the attacker always get a report and at the least, an estimate of spies. Reveal that you have been spied. An estimate of spies and their level. In utter failure the defender's part gets no report at all.